The webinar will present some findings from two recent reports by the Joint Research Centre of the European Commission, which have analysed Open Education policies Europe. ‘Going Open’ is a report bringing policy recommendations on open education at regional, national and EU levels. 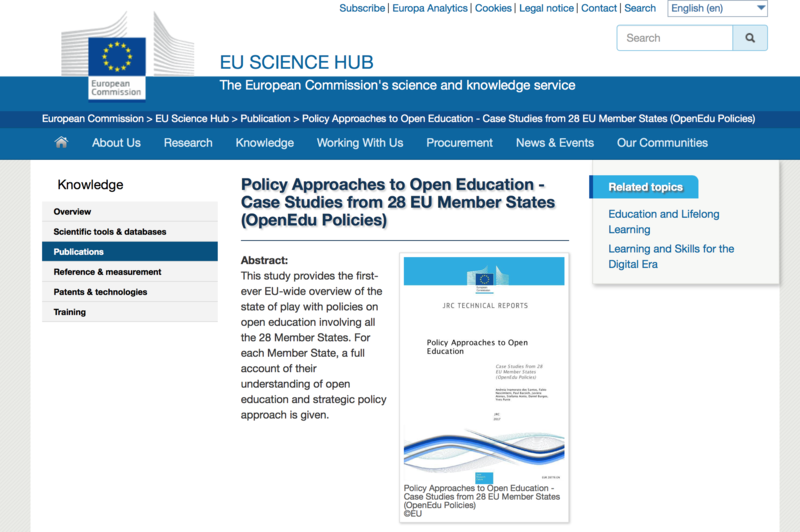 ‘Policy Approaches to open education’ is a report covering the 28 EU Member States, presenting case studies about how each country approaches open education policies. Both reports are part of the JRC’s OpenEdu Policies project. These reports are the final outcome of one and a half intense years of research into open education policies involving many stakeholders, particularly ministries of education, research and science across Europe. The event will focus on different kinds of existing policies, main barriers and enablers within these initiatives, and recommendations to implement successful initiatives aiming at opening up education.